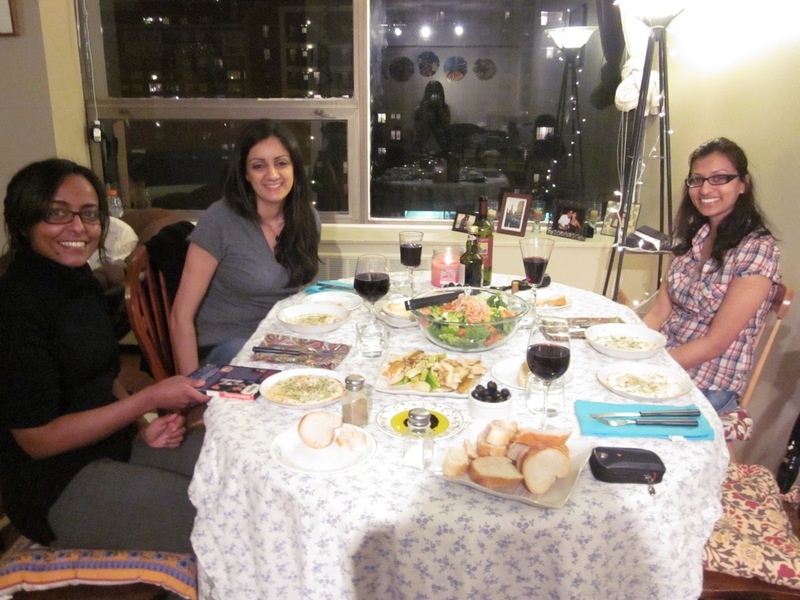 Themed Dinner Night – French. When Devang is on-call at the hospital, I take the opportunity to watch Real Housewives of…and eat ice cream for dinner. It’s true. Sometimes I do laundry, but on most nights I just lazy around watching TV and eating whatever I feel like. For a change, I decided to be a little more productive last night. Paris was still on my mind and I realized I hadn’t seen my girl friends in a while. I combined the two thoughts and came up with a brilliantly genius idea: A French themed dinner and movie night. Baked eggs with Provençal herbs and Parmesan cheese. Classic salad with French dressing. Salad of pears, green apples, walnuts, and honey. Panko encrusted Goat Cheese rounds. Olives, Oil & vinegar, French baguette. Profiteroles with ice cream, berries, and chocolate sauce. Thanks to Gigi, Komal, and Sujata for playing French with me! What themed dinner party would you like to attend?